Deterrents to choosing trauma surgery as a specialty. The most negatively perceived aspects by respondents were related to lifestyle factors. OR indicates operating room; SICU, surgical intensive care unit. Spectrum of appealing aspects of trauma surgery as a specialty. SICU indicates surgical intensive care unit. Ideal practice characteristics. Respondents listed lifestyle factors such as guaranteed appropriate salary and time away from work as the most important practice characteristics when choosing a career specialty. Hypothesis Presenting the opinions of surgical residents about the appeal of trauma surgery as a specialty may influence current reform. Participants General surgery residents (postgraduate years 1-5 and recent graduates) registered with the American College of Surgeons. Main Outcome Measures Career plans and perceptions about trauma surgery as a specialty. Results Of 6006 mailed surveys, we had a 20.1% response rate. Midlevel residents comprised most of the respondents, and most were undecided about their career choice or planned to enter general surgical private practice. The typical residency programs represented were academic (81.7%), urban (90.6%), and level I trauma centers (78.7%), and included more than 6 months of trauma experience (77.6%). Most respondents (70.6%) thought that trauma surgery was unappealing. The most important deterrents to entering the field were lifestyle, poor reimbursement, and limited operating room exposure, while increased surgical critical care was not seen as a restriction. When questioned about the future of trauma surgery, they believed that trauma surgeons should perform elective (86.8%) and nontrauma emergency (91.5%) cases and would benefit from active association with an outpatient clinic (76.0%). Intellectual challenge and exciting nature of the field were listed as the most appealing aspects, and ideal practice characteristics included guaranteed salary and time away from work. Conclusions As demand for trauma surgeons increases, resident interest has dwindled. As a specialty, trauma surgery must undergo changes that reflect the needs of the incoming generation. We present a sampling of current surgical resident opinion and offer these data to assist the changing discipline and the evolving field of acute care surgery. Growing interest in the developing field of acute care surgery has prompted much debate among general and subspecialty surgeons. The introduction of acute care surgery began with the changing paradigm of our existing trauma system and the changing face of the patient with trauma injury.1 The increased percentage of blunt trauma cases has brought critical care of the patient to the forefront of this discussion. However, there is a growing concern among attending trauma surgeons about what this will mean when translated to compensation and operative opportunities. Existing trauma surgeons are operating less, while more of their day is spent in the intensive care unit caring for patients with blunt trauma. Furthermore, the multiservice approach to trauma often leaves the trauma surgeon caring for critically ill patients who have been operated on by other services. This has resulted in resentment and dissatisfaction toward their field and that of subspecialty surgeons.2 Surgical residents, alike, have noted this dissatisfaction, and this has translated to a trend of decreasing interest in applying for trauma surgery and critical care fellowships. It is within this framework that the field of acute care surgery arose and subsequently generated considerable interest.3-10 Among the stir of discussion caused by attending trauma surgeons and the surgical societies, residents have largely been left out of the discussion. Herein, we present a broad sampling of current surgical resident opinions across all training years to gain a better understanding of their perceptions of trauma surgery and how marketable the field is today. Our study hypothesis is that presenting the opinions of surgical residents about the appeal of trauma surgery as a specialty may influence current reform. A 22-item survey was mailed to general surgery residents (postgraduate years 1-5 and recent graduates) registered with the American College of Surgeons. A self-addressed return envelope was included for convenience and to optimize the response yield. A traditional hard-copy survey method was used. Surveys were sent out only once to minimize duplication. Questions included demographic information about the resident and about the surgical training program. Respondents came from a spectrum of urban and rural settings, academic and private institutions, and trauma centers varying from level I to level III. Respondents were asked how much trauma experience they were exposed to in their training and what field, if any, they were interested in pursuing after completion of their residency. Questions included perceptions of current trauma practice, trauma surgeons, and their role in society. Incentives and disincentives of entering the field were highlighted, and residents were asked about their opinions on future changes. Detailed emphasis was placed on the addition of selected new orthopedic and neurosurgical procedures to the caseload of trauma surgeons and how current residents view this. For comparison purposes, some questions were adapted verbatim from a survey of attending trauma surgeons by Esposito et al5 with the permission of the lead author. There were different styles of questioning used in the survey. Simple yes or no questions and questions with a single answer choice were simple to analyze when converting to a percentage for graphing purposes. However, we divided each question into categories of high interest, no opinion, or low interest and grouped the rankings into these categories. For example, in the question referencing appealing aspects of trauma surgery, we analyzed the data according to groups of ranked answers of most appealing, neutral, or least appealing. In this way, we were able to average out the respondents in each category to the lowest total response count, creating a percentage of respondents per category. This allowed presentation of the data in percentage form, enhancing our comprehension of ranking question responses. Therefore, all data were developed from percentage analysis and are presented in the “Results” section. All analysis details and questions pertaining to analysis results were reviewed by the Department of Statistical Analysis, Boston University Medical Center. In addition, to examine how representative our survey responses were of the whole, we calculated 95% confidence intervals (CIs) for each question. In this way, we estimated random error and measured accuracy of our data as a sample of the whole. Respondents were differentiated by level of training and by geographic location. The levels of postgraduate training were compared among respondents (Table 1). It is clear from this distribution that midlevel residents composed most of the respondents. Table 2 gives the distribution of postmarked surveys by state. Postmarks of returned surveys were retained to ascertain what part of the country respondents came from. The list includes the states that were most represented from surveys returned with a postmark. The survey (Table 3) was not reviewed by an institutional review board panel, as it is not required by Boston University Medical Center. However, a cover letter and a final note at the end of the survey were provided as part of the mailed packet, which provided respondents with information regarding the survey and the purposes for which their answers were to be used in the future. A total of 6086 general surgery residents were identified by the American College of Surgeons database. Incorrect addresses were eliminated from the survey pool, leaving 6006 residents or recent graduates. Of 6006 mailed surveys, a 20.1% response rate was achieved. Midlevel residents comprised most of the respondents, and most were undecided about their career choice or planned to enter general surgical private practice. Of those who responded, 6.0% said they were interested in trauma surgery and 3.4% in surgical critical care. Only 1.2% said they were interested in academic general surgery. The typical residency programs represented were academic (81.7% [95% CI, 0.80-0.84]), urban (90.6% [0.89-0.92]), and level I trauma centers (78.7% [0.76-0.80]) and included more than 6 months of trauma experience (77.6% [0.75-0.80]). Most respondents (70.6% [95% CI, 0.68-0.73]) thought that trauma surgery was unappealing as a career choice, although 67.1% (0.64-0.70) thought it could provide a viable and sustainable practice. At the same time, 67.7% (0.65-0.70) believed trauma surgeons were undervalued. Sixty percent of respondents (60.3% [95% CI, 0.57-0.63]) listed lifestyle as the primary deterrent to entering the field of trauma surgery. Other commonly cited deterrents to entering the field were poor reimbursement (28.7% [0.26-0.31]), limited operating room exposure (33.7% [0.31-0.36]), and the patient population (26.4% [0.24-0.29]). Lack of elective cases (25.9% [0.23-0.29]) and malpractice (28.5% [0.26-0.31]) were ranked as insignificant aspects of trauma surgery when choosing a specialty. The least bothersome aspects of trauma surgery were length of training (46.3% [0.43-0.49]), professional respect (41.4% [0.38-0.44]), increased surgical critical care (30.6% [0.28-0.33]), and exposure to a dangerous lifestyle (25.2% [0.23-0.28]). These results are shown in Figure 1. The top 2 appealing aspects of trauma surgery as a career choice among respondents were intellectual challenge (43.8% [95% CI, 0.41-0.47]) and exciting nature of the field (51.4% [0.48-0.54]), while operative variety (41.3% [0.38-0.44]) and increased surgical critical care (43.5% [0.40-0.47]) were more neutral aspects. Less appealing aspects of trauma surgery were the opportunity to use new technologies (73.8% [0.71-0.77]) and the trauma surgeon's role in society (50.1% [0.47-0.53]). These results are shown in Figure 2. When questioned about the future of trauma surgery, 86.8% (95% CI, 0.85-0.89) of respondents thought that trauma surgeons should perform elective cases, and 91.5% (0.90-0.93) thought trauma surgeons should perform nontrauma emergency cases. Seventy-six percent (0.74-0.78) believed trauma surgeons would benefit from active association with an outpatient clinic. There was an even split in answers to the question of whether the scope of trauma surgery should be broadened to include placement of intracranial pressure monitors. However, an overwhelming 71.3% (95% CI, 0.69-0.74) of respondents thought the scope of the trauma surgeon should not include craniectomies. Of the respondents, 58.1% (0.55-0.61) thought trauma surgeons should not perform external fixation and traction of extremity fractures, and 80.1% (0.78-0.82) thought trauma surgeons should not perform open reduction and internal fixation of fractures. Among the bank of subspecialty procedures, half of the respondents thought angioembolization of pelvic fractures (50.0% [0.47-0.53]) and repair of cardiac wounds requiring cardiopulmonary bypass (49.7% [0.47-0.53]) were essential additional procedures in the options of a trauma surgeon. Repair of Le Fort fractures (59.7% [0.57-0.63]), open reduction and internal fixation of the spine (41.4% [0.38-0.44]), and repair of mandible fractures (29.0% [0.26-0.32]) were believed to be less essential to the training of trauma fellows and attending physicians. Seventy-eight percent of respondents (78.2% [95% CI, 0.76-0.81]) thought that trauma surgeons should complete a fellowship in both trauma surgery and critical care, and 70.0% (0.67-0.73) would like to see a combined fellowship with board certification in both. The top 2 important practice characteristics were guaranteed appropriate salary (63.1% [0.60-0.66]) and guaranteed time away from work (46.6% [0.44-0.50]). Seventy percent (70.2% [0.67-0.73]) thought additions of selected orthopedic and neurosurgical procedures were less important characteristics of a trauma practice. Other less important characteristics were decreased surgical critical care (55.2% [0.52-0.58]) and a practice that included a large group and offered diversified operative experience (19.2% [0.17-0.22]). Noninfluential characteristics of trauma surgery as a choice of specialty included subsidized ancillary benefits (33.0% [0.30-0.36]), subsidized reliable billing and coding support (30.0% [0.27-0.33]), stipend for on-call services (27.9% [0.25-0.31]), less night call (22.4% [0.20-0.25]), and more general surgery (23.6% [0.21-0.26]). These results are shown in Figure 3. Historically, trauma care was adapted from the military sector and was molded to fit the civilian population. Penetrating trauma was abundant even in the civilian sector, and trauma surgeons performed a wide variety of surgical procedures. The 1960s to 1980s saw the trauma surgeon as the “master technician.” The 1990s saw the emergence of surgical specialists and subspecialists, and the scope of the trauma surgeon narrowed. Surgeons began to see an increase in blunt trauma, and nonoperative care became the mainstay of many traumatic injuries as the trauma surgeon became more of a critical care specialist and less of an operating surgeon. The new millennium saw a paradigm shift in trauma surgery, with surgical societies noticing that the specialty needed to change along with it. As the demand for trauma surgeons increases, dwindling interest among residents has prompted appropriate alarm in surgical communities and has triggered many to look at how the field must adapt to meet the ever-changing demands of society. Proposed changes in trauma surgery as a specialty must reflect the needs and preferences of the incoming generation, as well as benefit the existing trauma surgeon. We present a sampling of current surgical resident opinion and offer these data to assist the changing discipline and the evolving field of acute care surgery. Esposito et al note, “When my grandfather was a doctor, it was a vocation. When my father was a doctor, it was a profession. Now that I’m a doctor, it's a business.”5(p15) The authors further contemplate, “What does business do to recruit the cream of the crop? They identify what those potential recruits want, and then make every effort to offer it to them.”5(p15) This business model should be adopted by those who are restructuring the face of trauma surgery.5-12 Despite years of discussion about proposed changes to the field, it has not become more marketable to the incoming generations of surgeons. Our survey provides a window into the business model, determining what potential recruits want. Therefore, it offers valuable information for restructuring of this surgical specialty. Most respondents believe that trauma surgery must change for it to become appealing and marketable to the rising generations of surgeons. Responses also show that the perception of a career in trauma surgery is that of an attending house officer, with the specialty of decreased value to society. It is clear that surgical residents still believe that the variety and exciting nature of the field are attractive to them; however, the disincentives of lifestyle, irregular compensation, and work hours thwart the desire of many potential recruits to the field. Looking toward the future, surgical residents believe that a trauma surgeon should perform nontrauma emergency procedures and have an active outpatient clinic. Despite this, most are skeptical about the issues surrounding broadening the scope of the trauma surgeon to include procedures under the umbrella of other subspecialty surgical departments. Prior sampling of chief residents found that recent graduates who chose not to enter a critical care fellowship listed nonoperative case mix, practice lifestyle, experience and impressions during residency, and income as the negative aspects of trauma that influenced their opinions.11 Our survey seems to corroborate these findings across all levels of resident training. Potential biases of this study include the 20% response rate, representing 1201 general surgical residents across the United States. The hard-copy survey was mailed once over the course of 1 year. Electronic mailing would have increased the response rate tremendously, but this option was unavailable. Within our sample, another possible bias is that most respondents were midlevel residents and were not completely decided about their careers. However, one could argue that by the middle of surgical training a trainee has been exposed to most surgical specialties. There is also potential bias related to the academic, urban, and level I trauma residency program characteristics among our sample, as is the fact that all respondents are registered with the American College of Surgeons, an academic organization. It is possible that many residents who train at community and rural hospitals with undesignated trauma level status may not obtain adequate trauma experience to form an opinion about the discussion at hand. However, it is precisely these residents who will be affected by changes in the field, as trauma surgeons in rural settings will not have the benefit of readily available subspecialty assistance. This highlights another potential source of bias in that subspecialty surgical residents were excluded from this survey unless they were postgraduate-year-1 preliminary with a designation in a subspecialty surgery. A parallel survey of subspecialty surgery residents and attendings would be helpful for comparison. Several subspecialty societies have been specific about their views on the idea of expanding the scope of the trauma surgeon, and it would be useful to see how their residents view the issue. For example, the American Association of Neurological Surgeons and the Congress of Neurological Surgeons have stated that the care of patients with a neurosurgical emergency is best provided by a neurosurgeon.13 Members of orthopedic societies, including the Orthopaedic Trauma Association and the American Orthopaedic Association, have spoken against general surgeons providing orthopedic care to patients with trauma injury.14 It would be useful to survey what orthopedic and neurosurgical residents think about the issue. As stated earlier, some questions in our survey were adapted from a questionnaire among attending trauma surgeons by Esposito et al.5 A few questions deal with issues such as coding and compensation that residents do not have a full understanding of and may not rank as incentives or as disincentives. Such issues may be rarely addressed during surgical residency training. An additional limitation is the format of questions with yes or no responses without the option of an open-ended or “no opinion” response. Also, there is author bias in the wording of the questions (eg, “nonessential,” which may have a particular connotation to a reader). 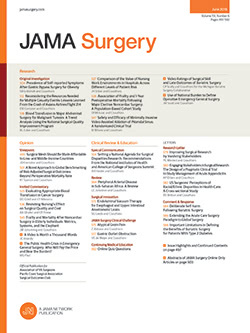 This article is an additional piece to the puzzle of restructuring the face of trauma surgery and the advent of the field of acute care surgery.11-13 It is imperative that residents' views are included in the discussion of the future of trauma surgery, as they are the incoming generation who will be tomorrow's trauma surgeons. For the benefit of the patient and the multidisciplinary teams involved in patient care, all parties must be satisfied with their positions and skill sets to provide optimal care to the patient with trauma injury. Serial surveys of residents and attendings should also be performed to gain a real-time impression of the ever-evolving field. Correspondence: Suresh Agarwal, MD, Department of Trauma Surgery, Boston University Medical Center, 850 Harrison Ave, Dowling 2 S, Ste 2508, Boston, MA 02118 (suagarwa@bu.edu). Accepted for Publication: December 17, 2009. Author Contributions:Study concept and design: Hadzikadic, Burke, and Agarwal. Acquisition of data: Hadzikadic. Analysis and interpretation of data: Hadzikadic, Esposito, and Agarwal. Drafting of the manuscript: Hadzikadic and Agarwal. Critical revision of the manuscript for important intellectual content: Hadzikadic, Burke, Esposito, and Agarwal. Statistical analysis: Hadzikadic and Agarwal. Obtained funding: Agarwal. Administrative, technical, and material support: Hadzikadic, Esposito, and Agarwal. Study supervision: Hadzikadic, Burke, and Agarwal. Previous Presentation: This paper was presented at the Podium Presentation of the 2009 Annual Meeting of the New England Surgical Society; September 12, 2009; Newport, Rhode Island; and is published after peer review and revision. Additional Contributions: Wayne W. Lamorte, MD, PhD, and medical students Michael Bohanske, BA, EMT-I/C; Cindy Hsu, BA; Yoona Kim, BA; Joanna Ng, BA; Anna Royer, BA; and David Young, MS, assisted in the data collection for this project.